Why I decided that all current board games needed a facelift. I have a secret. I’ve been working as a video game developer for years, but really what I like to play are designer board games. Games in the general category of Settlers of Catan, though that one has lost much of its sheen for me. There are plenty to choose from, though, and I’ve played dozens over the years, since well before the current board game craze. But I hate spending time setting them up and cleaning them up. To my mind, this is something computers should do for us! I can buy some of my favorites for the iPad, but few of those are designed to be played with friends, which is half the point. So I want to create an awesome, modern, easy-to-learn designer board game that I can play with friends. And if it’s going to be on a tablet, there’s no reason for it to be limited to the kinds of things you can do with cardboard and dice. I want to create the first in a category of modern digital board game; something more than you can do with paper, but still just as fun. No pressure! 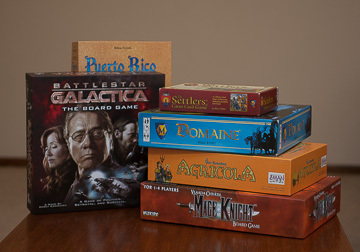 Though when I say “first” in this category of digital board game, I mean “first on current technology.” In the dark history of computer games, you’ll find a few here and there that were effectively multi-player digital board games. My favorite was M.U.L.E.. Feel free to call out your favorites in the comments below! So what are my qualifications to develop such a game? Well, I’ve programmed or contributed to the development of over a hundred video games, so when it comes to coding, I know what I’m doing. But when it comes to board game design, I don’t think that’s enough. So I’m partnering with a friend who has real experience on the design end of both board games and video games. Even better, he has experience designing a game similar to what we want to make. I’ll be introducing him on the blog soon. Doing a game for tablets that represents a board game will grant us a bit of freedom: The art needs to be awesome, but doesn’t necessarily need to animate. I’m not trying to create a first-person military shooter with 3D graphics and real-team physics; I’m trying to create a fun strategy/adventure game, possibly with RPG elements. But there are many risks; adding too much “secret” complexity could hide too much from the player. One of the charms (in my opinion) of playing with cardboard and dice is that you can know the odds. If we hide too many of the details from the player, then my claim that this is a “digital board game” really falls flat; I don’t want to create yet another video game. I just want the computer to handle the scut work while I enjoy a fun board game with my friends. EDIT: See also my newer blog entry on how digital board games can allow for more complexity and yet end up simpler. I’ll be posting some details about the game design soon. Try to imagine a cooperative RPG based in a science-fiction world with a Feudal Japan/Steampunk aesthetic. No, I’m not kidding, and the art is awesome. New site! Better! Stronger! Faster!